The Communicator Awards are judged and overseen by the International Academy of the Visual Arts (IAVA), a 550 + member organization of leading professionals from various disciplines of the visual arts dedicated to embracing progress and the evolving nature of traditional and interactive media. The competition received over 6000 entries this ear. The Communicator awards is the leading international awards program honoring creative excellence for communication professionals. Welcome back to the intern blog! 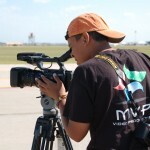 The guys and I just got back from a shoot in Sioux Falls, South Dakota, at the 114th Fighter Group National Guard Base. 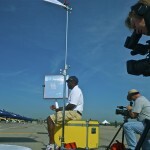 While at the base, we filmed the Blue Angels Navy demonstration team for an upcoming science related television show. 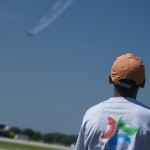 We were given “all-access” to the Blue Angels show, pilots, and crew members for an exceptional “behind the flying” experience. Welcome to the Intern Blog! Hi! My name is Isaac, and for the past few weeks I’ve been working as an intern for the guys at MVP. I’m a junior in high school, and I’m interested in a career as a video or film producer. I’ve had a great time at MVP, and it has been a perfect way to obtain some first hand experience in the field of video production. I’ll be posting updates showcasing my MVP experience frequently, so be sure to keep an eye out for them! Kirk Monson and Jeff Zahrt were interviewed this morning by Z102.9 KZIA in anticipation of tonight’s world premier of Resilience – The Spirit of Humanity. “Resilience – The Spirit of Humanity” is the documentary film about the unsung heroes who helped save Cedar Rapids, Iowa from the disastrous Flood of 2008. MVP Video Productions started filming during the flood of downtown Cedar Rapids and filmed for 30 hours straight during the peak of devastation to downtown Cedar Rapids. As Cedar Rapids recognizes the one-year anniversary of the 5th largest natural disaster in the history of the United States. “Resilience” will premiere tonight to kick-off the Downtown Districts RIVERenaissance event. You can see the movie at 7:30 pm at the U.S. Cellular Center in Cedar Rapids. Doors open at 6:30 pm.